The course revolves around group “build a network” games, and those games will clearly play out differently depending on the attendance. 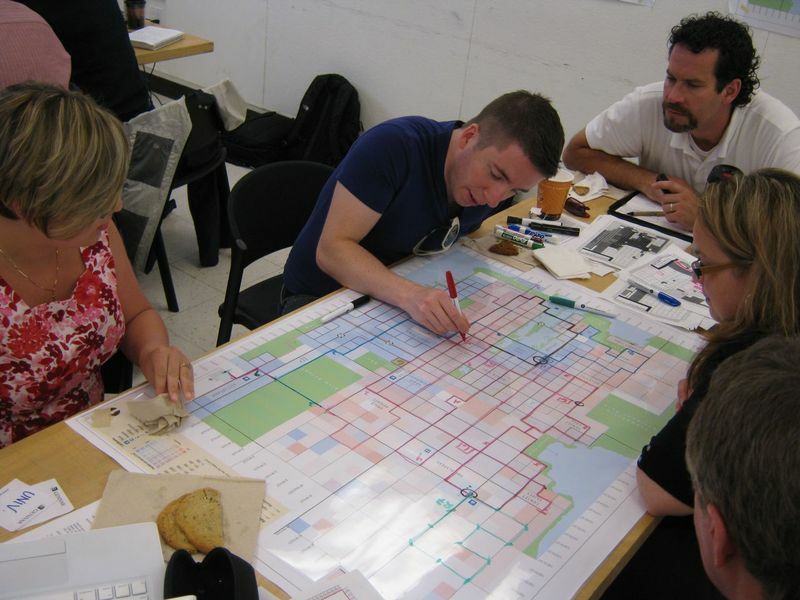 Our course included several staff who work on bus scheduling, several who work on rapid transit planning, and many in areas further afield. That meant that each group had several experienced and numerically savvy staff, who could quickly get up and running with headways, frequencies and cost unit rates, without any tutorial. For the less experienced staff – they didn’t really get to run the show, as the learning curve was often steep. However, I think you’d still learn a lot in that situation, watching the experienced staff build a network from scratch, and having discussions when the group didn’t agree or when someone didn’t understand the reasoning. If you’re numerically inclined, you’d also quickly pick up the “sketch math” behind the service budget. On the more experienced end, I still got a few interesting insights in several areas. In low density areas with low frequencies and low traffic congestion, “anywhere to anywhere travel” can still be provided – if all buses serve a single hub, and synchronize their arrival/departure to allow riders to transfer from any route to any other route. I’d run into these previously in Guelph and at Phibbs Exchange in North Vancouver, but I’ve never had to plan one myself, or think about how to integrate it into the more urban, high-frequency grid parts of the network. See more discussion from Jarrett Walker here. The course was a great chance to experience how “effective and affordable” a grid system felt, and how painful it felt when geography or the road network prevented a grid system. The demo city is built around a harbour that would be very expensive to bridge, and the one bridge across was a 1970s freeway bridge with very poor connections to neighbouring areas. Additionally, that entire part of town had very few “through” routes. As a result, any cross-harbour route was very meandering and therefore very expensive to operate, and the budget simply didn’t allow a high-frequency cross-harbour route. However, In a later phase of the course when we were given a capital infrastructure budget, it felt natural to spend money to fix this – by building a new bridge, or by building new elevated/underground routes that allowed a direct “through” route in that part of town. It’s a very different strategy from the usual “build a BRT” strategy – instead of spreading money thinly across a long corridor, you spend large quantities on several strategic, short sections in the interests of reaping large operating savings and quicker, straighter travel. This certainly happens on a small scale – individual intersection treatments, bus bypass lanes – but it rarely gets considered at the $50-$150 million scale. See more thoughts from Jarrett Walker on grids here. Jarrett Walker’s book raises the idea that building a transit network for maximum ridership and building a network for full coverage of the city are competing goals. The highest-ridership network possible will not reach every part of the city; in fact, it will likely deliberately avoid many low-density areas. This idea is discussed quite well in his book, and the course included several games designed to illustrate the tension between the two goals. That did start me thinking a bit more about the tradeoff, particularly on a different but related problem: designing service on a single corridor using either a “local” (300m) or a rapid (1km) stop spacing. In Toronto, the TTC designs most services as “local” services with a close station spacing. This has the effect of ensuring that there is excellent coverage with short walking distances for those on the arterials. The routes are popular enough that they can run at high frequencies. The challenge is that running two services reduces the overall frequency, and the two services compete with each other. If most riders prefer the “rapid” service, then the agency will have to either reduce the frequency of the “local” or subsidize it more heavily. This has certainly happened in some places that operate rapid service. In essence, in some markets the “rapid” service is the best service to maximize ridership. If ridership was the only goal, an agency might not even choose to run a local service, or might limit it to hourly service. By simply not operating rapid services, the TTC avoids this conflict. Coverage is maintained, decent ridership is achieved, and frequencies are kept high by avoiding a split of service into a local/rapid overlay. However, this choice may be: suppressing some ridership; causing longer trip times for many riders; and costing more, as rapid services are cheaper due to their speed. The TTC does operate a few rapid-type services. The #199 (Finch East) is probably the only true rapid service, but doesn’t operate on Sundays or late evenings. The #190 (Sheppard East), #41E (Keele), #53E/F (Steeles East) and #95E (York Mills) are next in line, but #190 is short enough to not really serve a grid line and the other “E” series routes only operate during peak periods. Other routes get progressively less and less “rapid”-like. The 2009 Transit City Bus Plan showed where the TTC would like to go if they had more budget, and it does include increases in frequency for existing “express” services, but little interest in restructuring to a rapid-type service. At any rate – this is not intended as a critique of TTC policies. The idea of “designing exclusively for ridership” just triggered this series of thoughts for me about local-vs-rapid service.